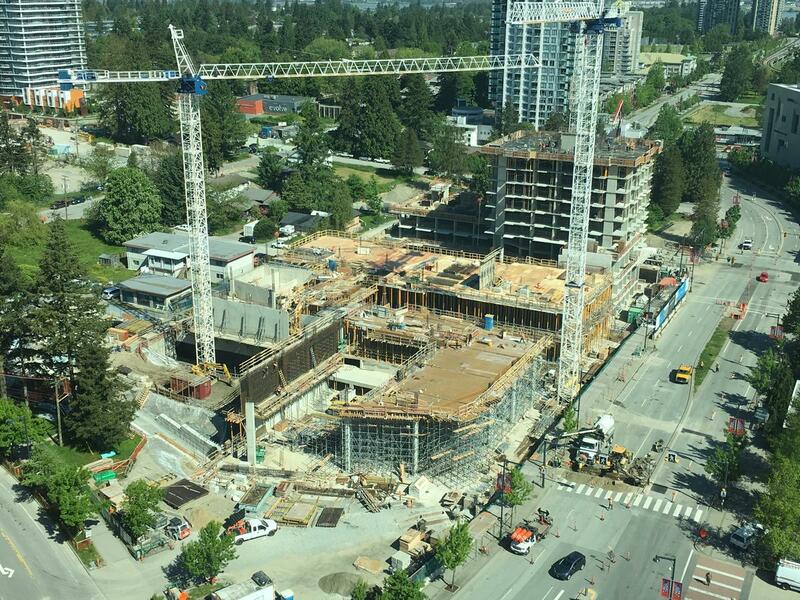 SFU’s first phase of expansion in Surrey continues to progress quickly at University Dr and 102 Ave. 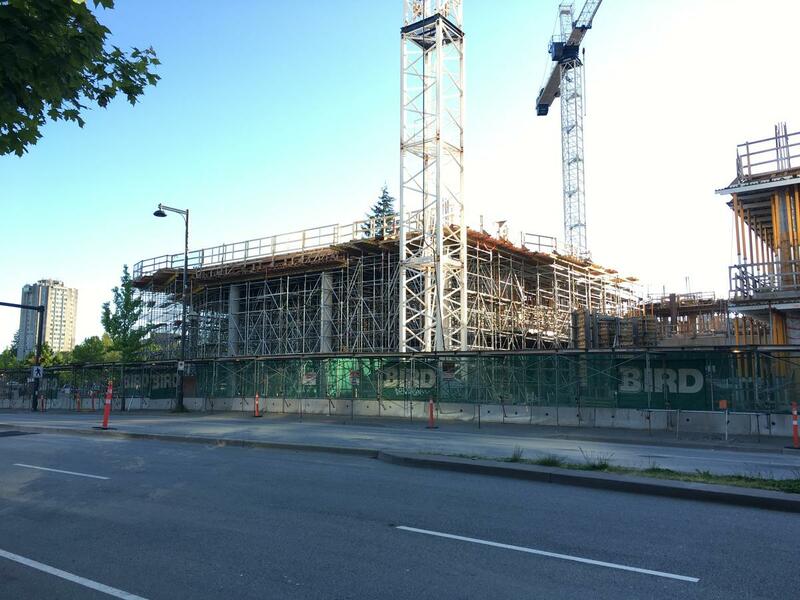 The building has now reached 2 levels in height north of its future atrium, while a double height first floor and lecture theatre are under construction on its southern portion. 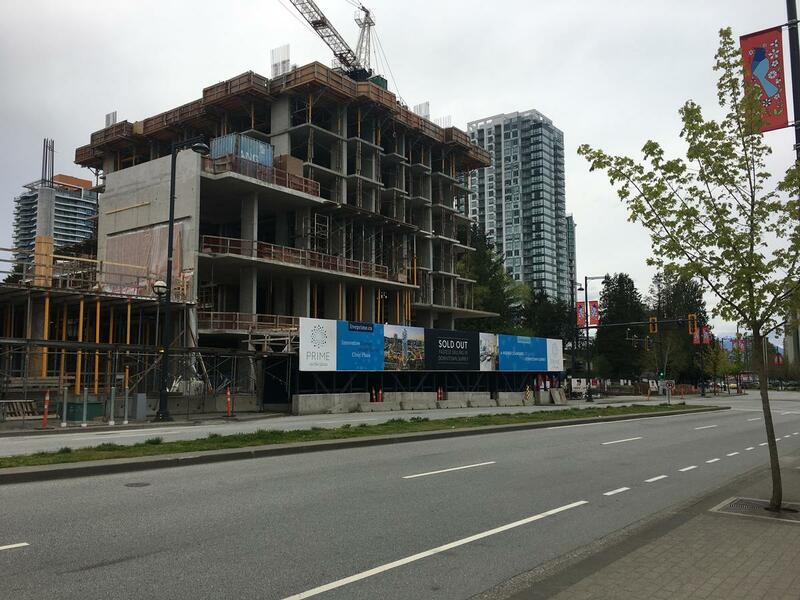 To the north behind it, Prime on the Plaza also continues to rise, now at a height of 10 storeys. SFU’s Sustainable Energy & Environmental Engineering Building is the first of a planned 3 phase expansion of the campus on the parking lots surrounding Central City. 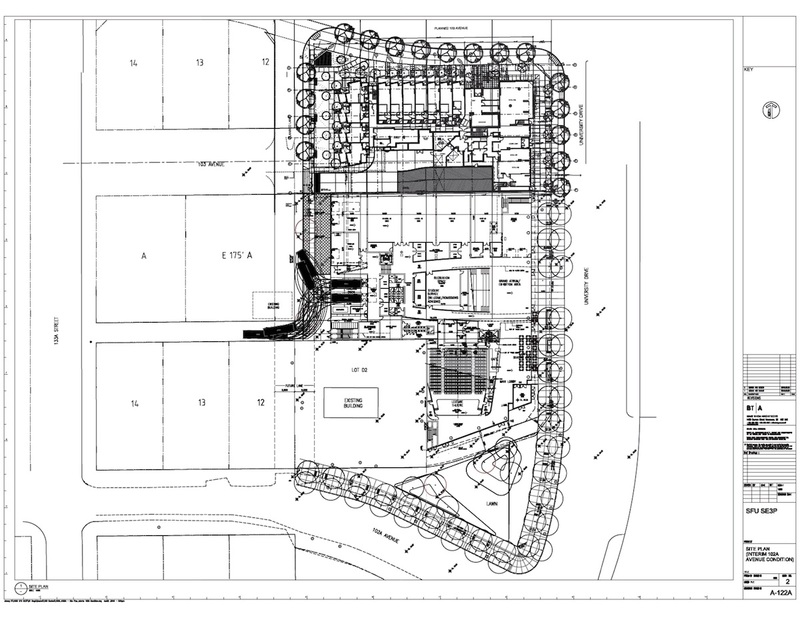 A residence tower is also planned next to this current phase on the remaining portion of the site framed by the ‘L’ shape of the building, fronting 102 Ave. 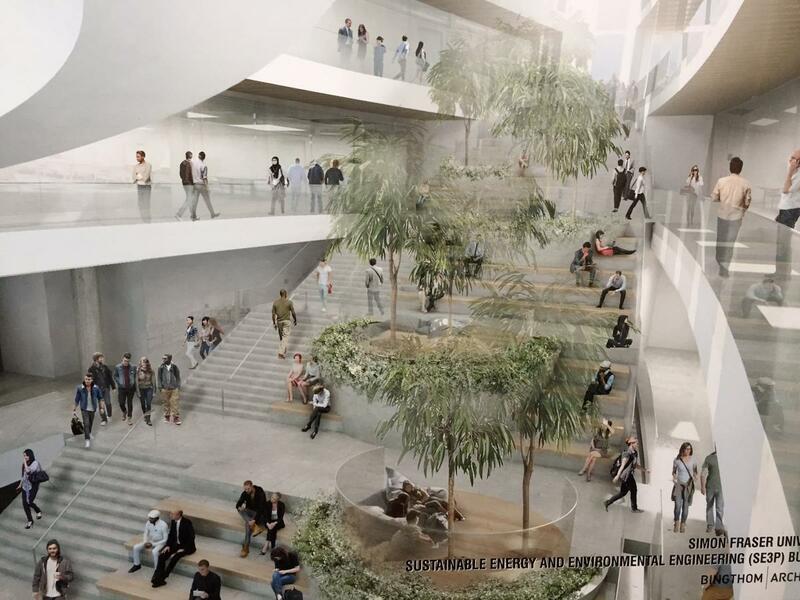 It is expected that the Sustainable Energy & Environmental Engineering Building will be completed as early as spring 2018, and open for classes by fall 2018. Reliance Properties and MacDonald Development’s Prime on the Plaza is beginning to rise quickly now over University Drive. 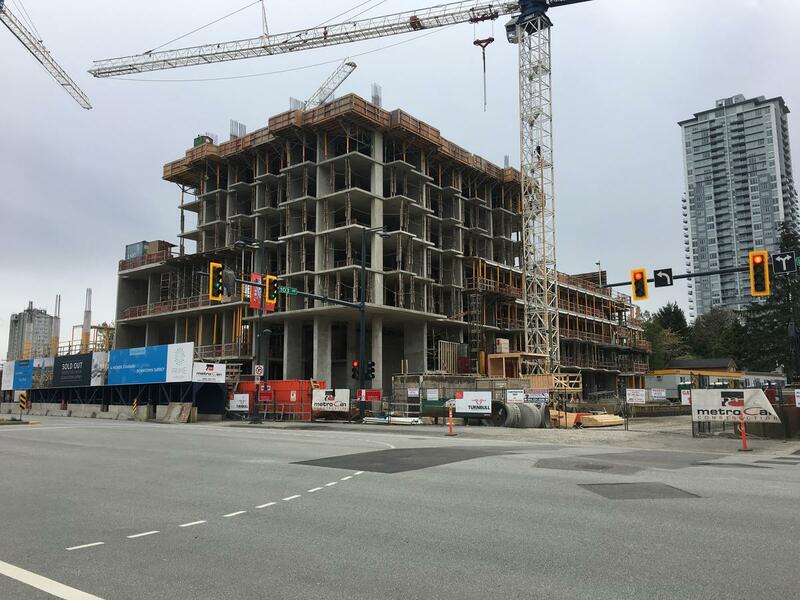 Over the past month the building’s 4-storey townhouse / retail podium has taken shape, with work on the tower floors now progressing at a rate of about 1 floor per week. 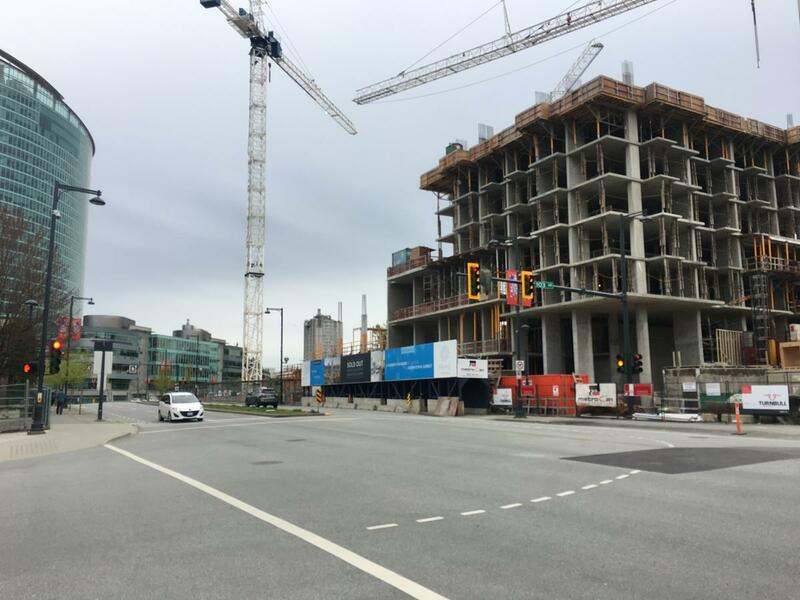 With the tower now 7 floors above ground, and 30 floors left to go, it could reach it’s final height by the end of the year, in roughly 30 weeks or 8 months. 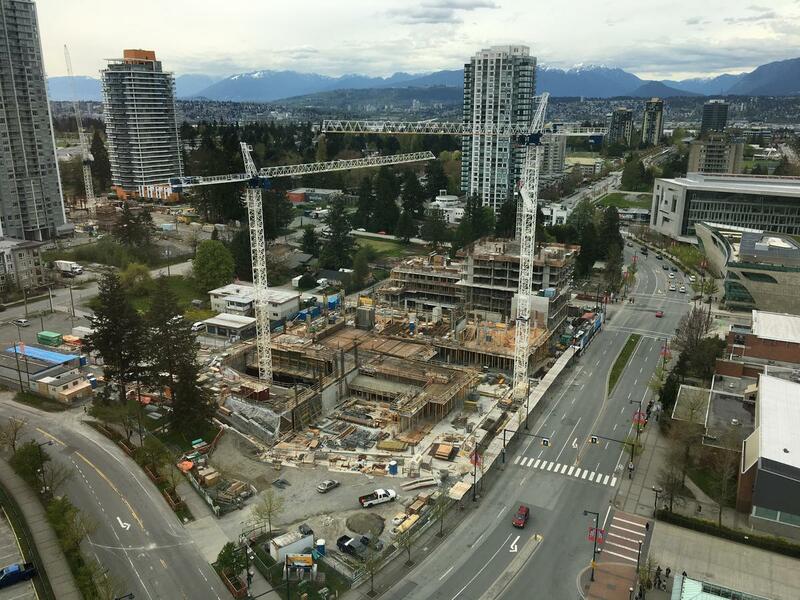 To the adjacent south of the project, SFU’s Sustainable Energy and Environmental Engineering Building also continues to progress quickly, with that project now 1 floor above ground for much of the site, and work beginning on the 2nd floor. 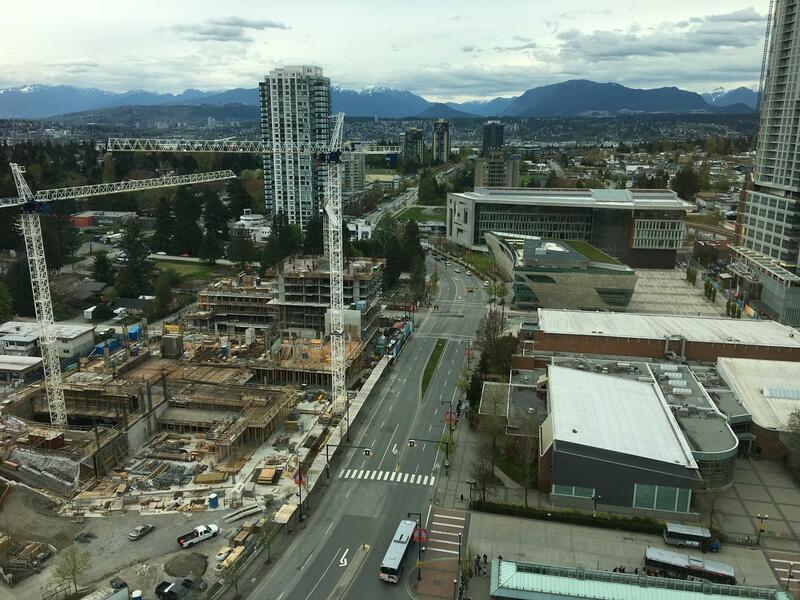 The much anticipated government funding for the SFU Surrey expansion was finally announced today at a much-publicized event on the Surrey campus. At the event, Prime Minister Justin Trudeau and Premier Christy Clark announced Federal and Provincial funding in the amount of $45 million each to the project. 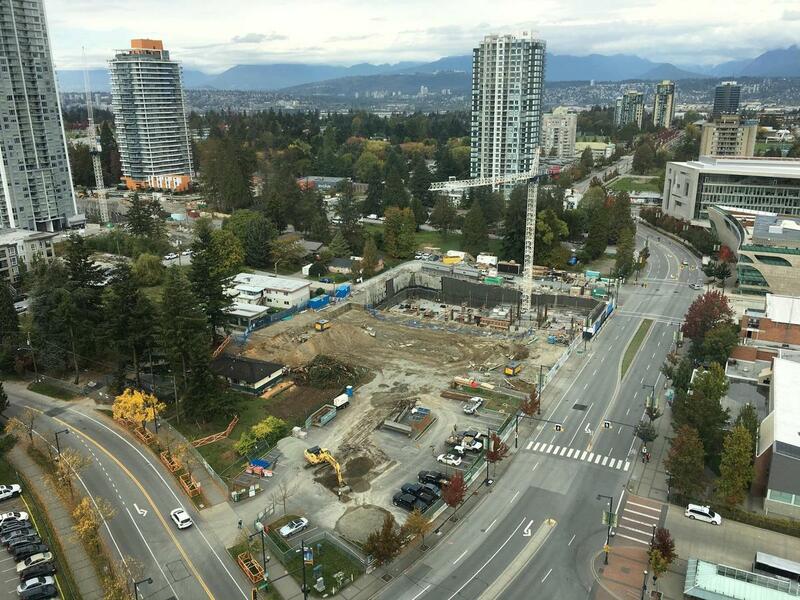 This funding will go towards the already underway first phase of a 3-phase expansion of the campus, with an additional $26 million from SFU and donors to fund future phases 2 and 3 on the remaining recreation centre surface parking lots. 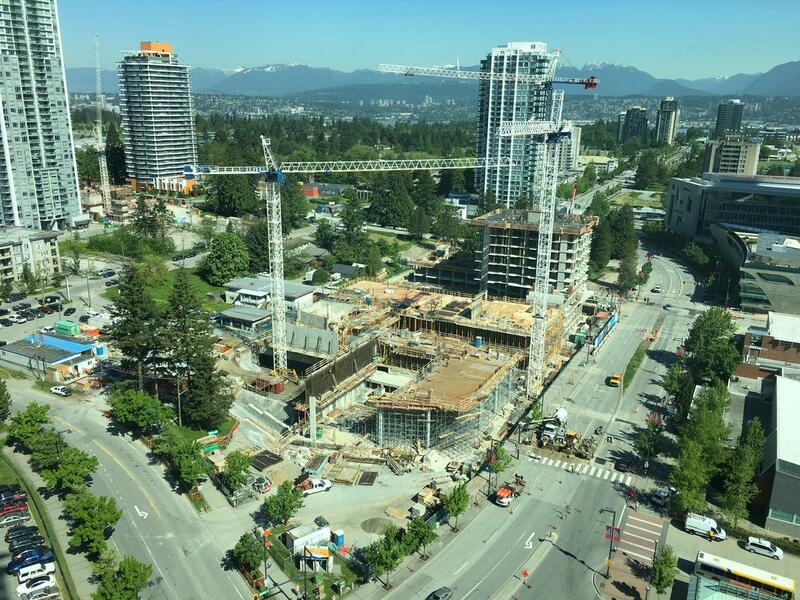 While today’s announcement was news to many, UrbanSurrey first reported on the SFU expansion back in early June 2016 after a development application was submitted by SFU on the subject site at University Drive and 102 Avenue. Since then, today’s announcement has revealed that the new building is on track to open in Spring 2018, and that it will house the proposed Energy Systems and Environmental Engineering Program – an interdisciplinary engineering stream that will support the clean tech and sustainable energy sector. 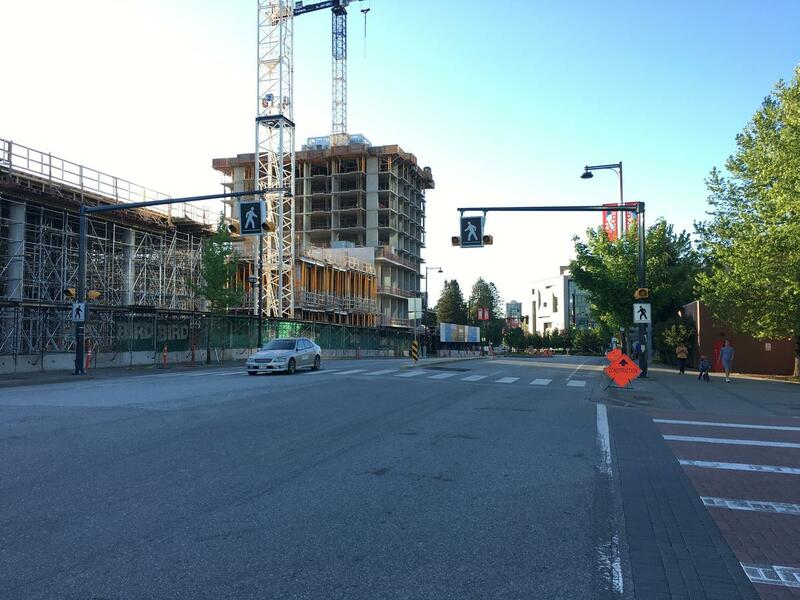 New renderings were also released today, similar to those posted by UrbanSurrey back in July. 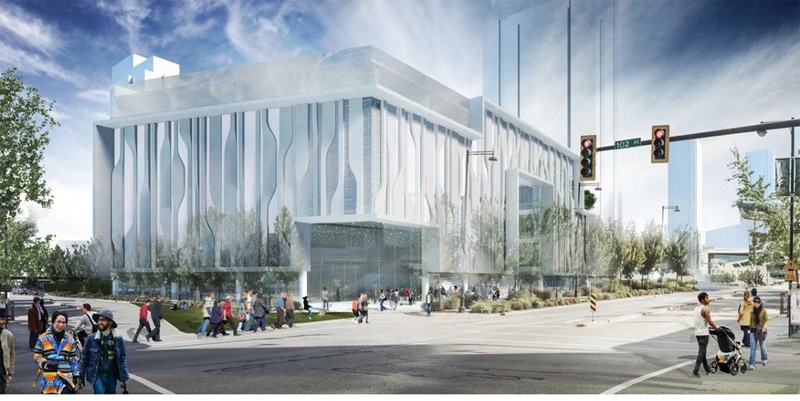 The Bing Thom designed building will be a great addition to the City Centre as part of a rapidly changing University Drive. 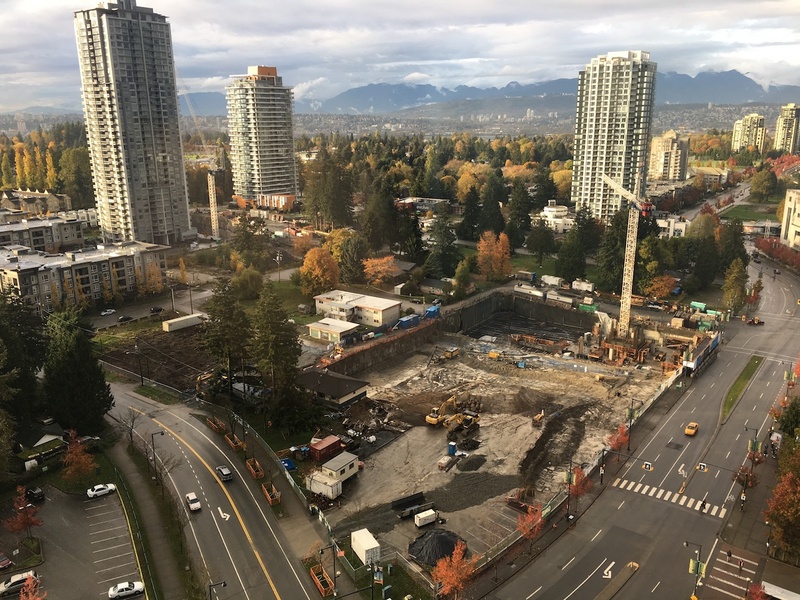 Further to the update earlier this month on the SFU expansion project, more site clearing has taken place adjacent to the project. 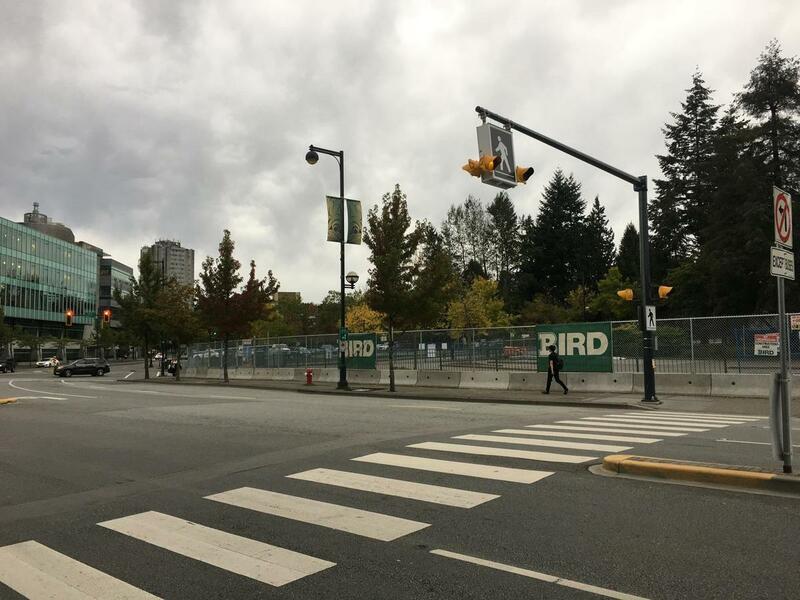 As of Oct 27th, trees on 3 lots to the west of the project were cleared, and the site is now being prepped for what appears to be a construction staging site for the SFU project. 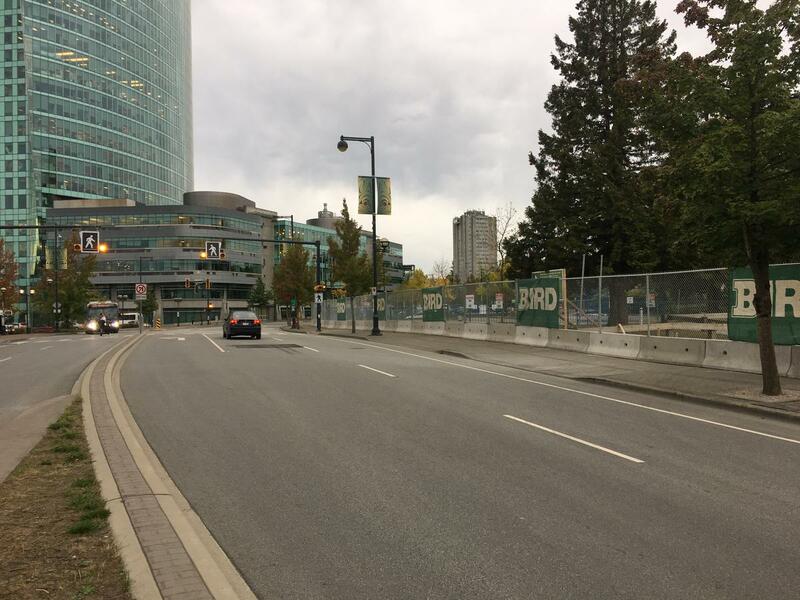 No development applications have been submitted on the lots, all that is known is that they are owned by the City of Surrey. 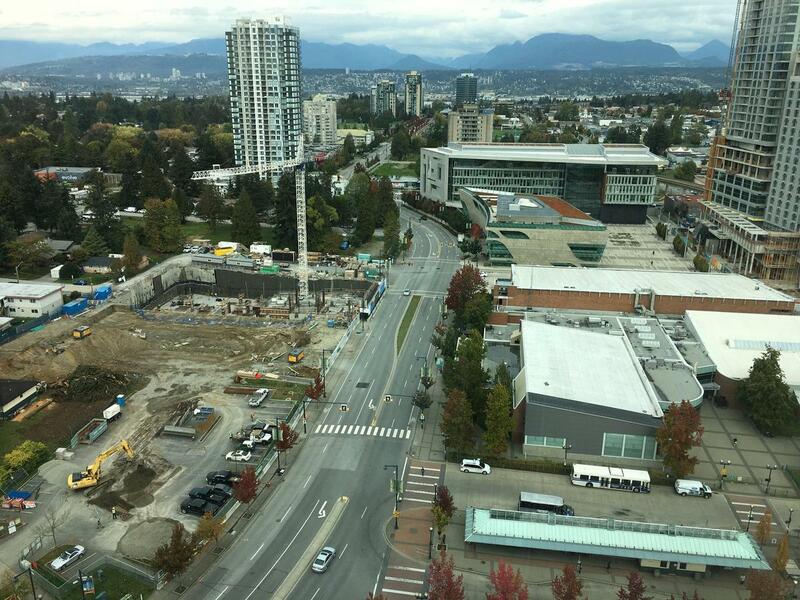 When complete a new Urban Green Lane will run North-South between these recently cleared lots and the SFU project, as shown on the plan below. 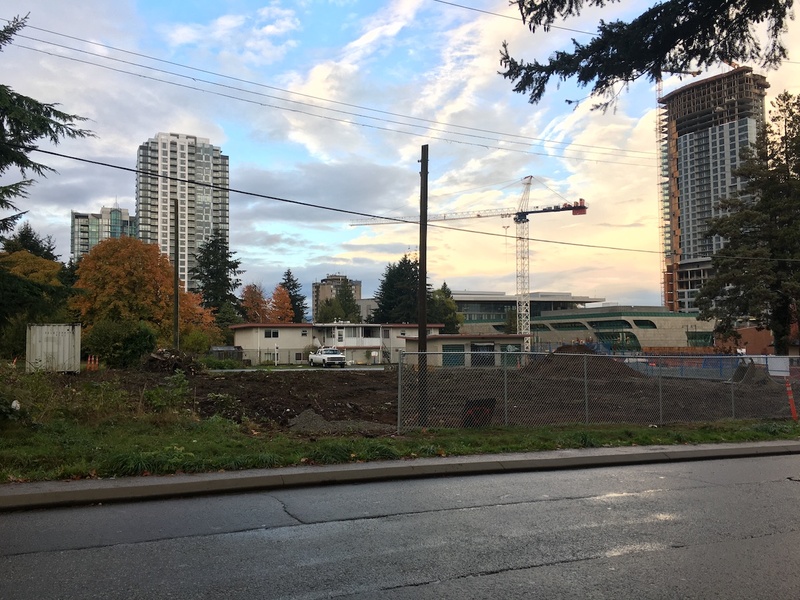 With this added clearing of trees, the area west of University Drive known as West Village continues its transformation into Surrey’s first high-density urban neighbourhood. Progress continues on the SFU Surrey ‘Sustainable Energy and Environmental Engineering Building’ at 102 Avenue and University Dr. Over the past few weeks, the site has been cleared and is now undergoing excavation to allow for the construction of a single level of underground parking below what will be a 5-storey building. 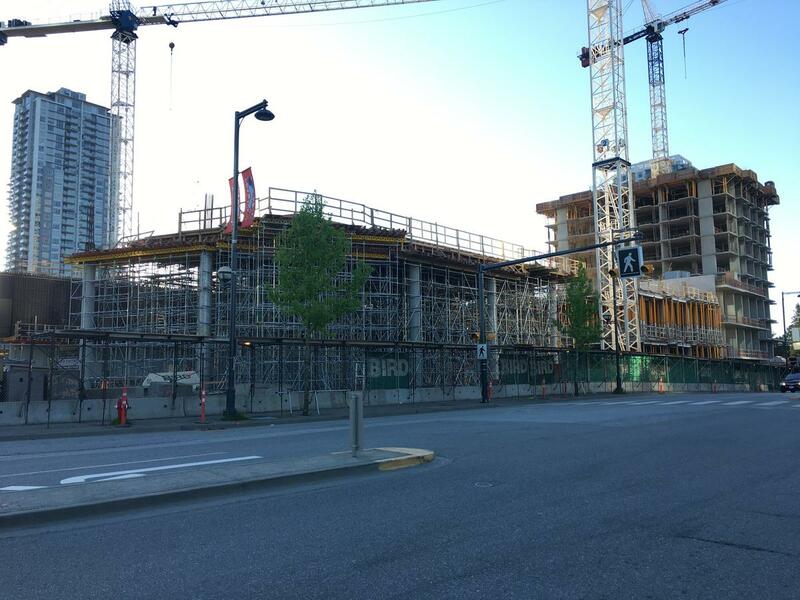 Despite the activity on site, the project has yet to receive 4th-reading / final approval from the City of Surrey. The project is being fast-tracked to meet a deadline for Federal funding, which stipulates the building must be substantially completed by April 30, 2018. Preliminary Approval was granted in July, and it is expected final approval will come later this year. 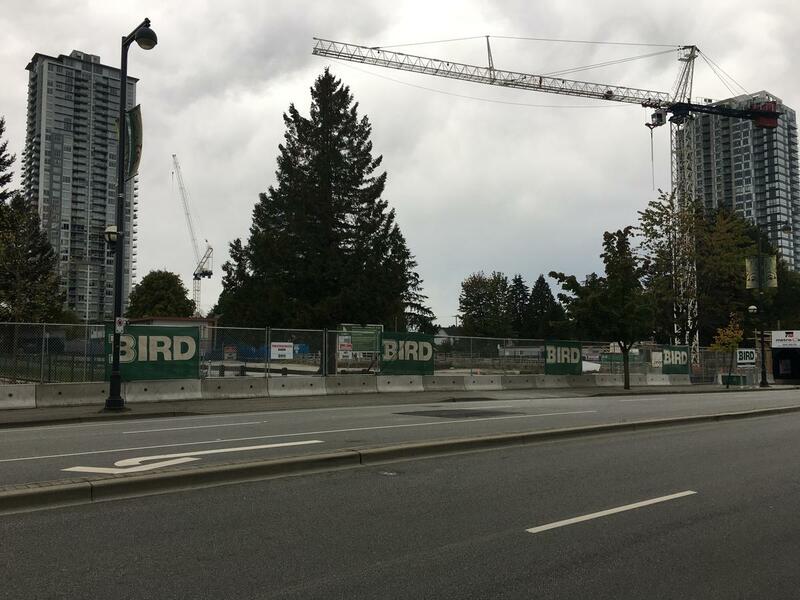 Construction fencing is now up at the SFU Sustainable Energy & Environmental Engineering Building site at 102 Ave & University Dr. 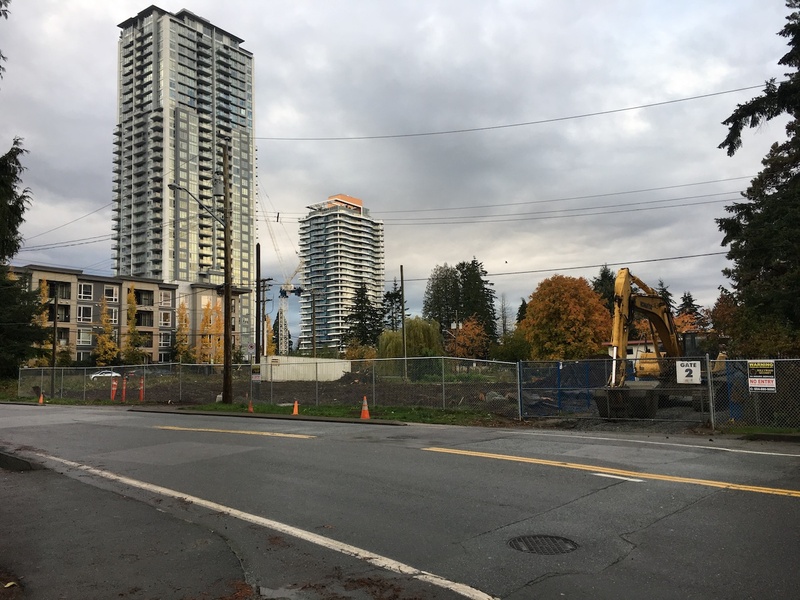 While the project has not yet received 4th reading / final approval from Surrey City Council, this is a good indication that they expect to soon, and are aiming to get a head start on site preparation so that clearing and excavation can begin this fall. It also now appears that the remaining house to the adjacent north of the site on 102A Ave may be set to be demolished soon as well, with numerous construction trailers now on the property. The vacant lots further to the north of it have also seen some site cleaning this week, perhaps indicating that trees on those properties could soon be removed. 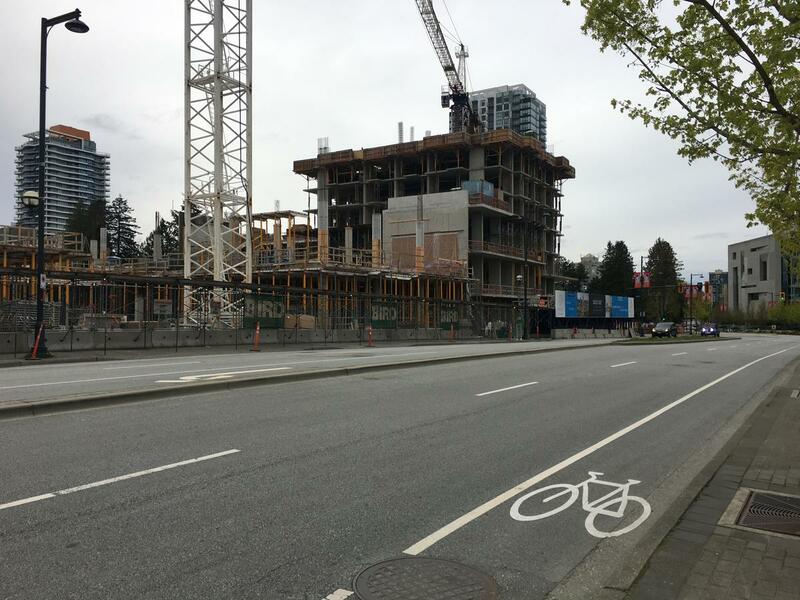 These properties have been indicated as a future site for an SFU residence tower, as well as new Urban Green Lane which will run behind the new SFU Building.